Oh baby, welcome to the world. Printed on high quality sunshine yellow 250gsm matt card with silver ink. 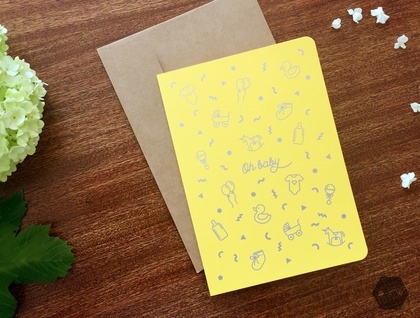 This card is blank inside and comes with a 120gsm kraft envelope. Packaged neatly in a cellophane bag. Card is A6 size (148mm x 105mm). See my other listings for more greeting cards and gift tags. Contact inkertinker to enquire about payment or shipping options.